Sign up to my newsletter and you can enter the free draw to win this original painting worth £130 of Quay Hill, Lymington, Hampshire, UK. 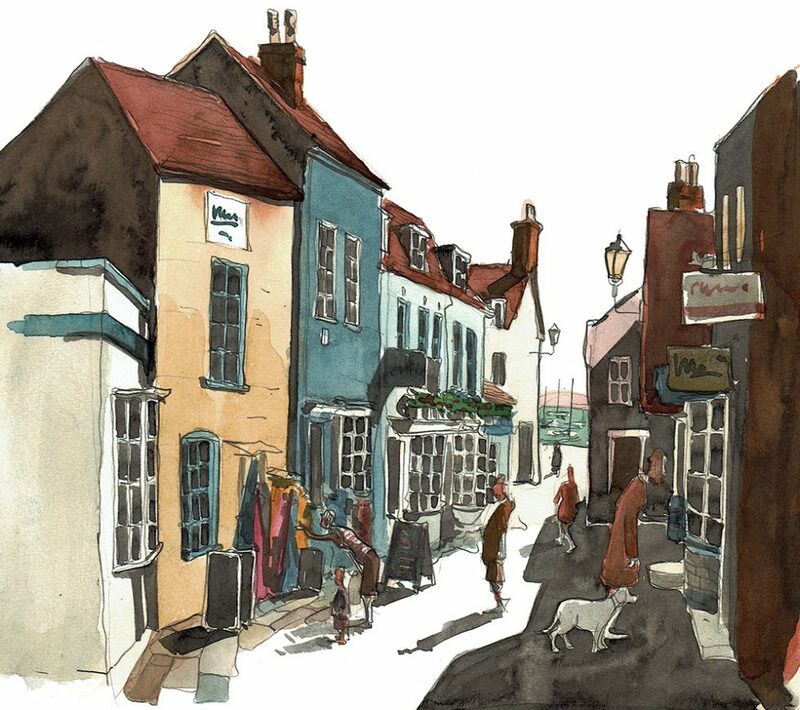 This watercolour study of Quay Hill in Lymington is 23cm x 20cm, signed and mounted on acid-free card. The newsletter will be sent out on the 30th August 2018. I look forward to your sign up in the box on this page. I give away free paintings, drawings, exhibition tickets, and prints with my newsletters. Just to note, you are also automatically entered for all future draws as long as you are still signed up. Once you are signed up you are automatically entered for all draws so long as you are subscribed. This view is of Quay Hill which leads down from the main part of the town to the harbour. It is peppered with eateries, pubs, and shops which try to catch a bit of trade from the passing visitors. A settlement has been here, tucked away on the banks of the river Lymington since the 6th Century, and has been inhabited ever since with a listing as “Lentune” in the Doomsday book in 1086. The village has survived through fishing, ship building, salt making, and even as an army garrison at one point. It seems Lymington has responded to the changing times rather well over 1,400 hundred years. Lymington has slowly grown into a small town (9,300), and these days, is one of the south coast’s centres of yachting so is very popular with tourists. During the summer months, it’s packed out, and those that aren’t sailing about, are watching those who are, whilst catching crabs from the quay with bits of bacon and string. Love the pictures, but especially the 2 of Lymington, as we lived not far from there at one time. Brilliant,I can picture us walking down Quay Hill just like that.